Home Primer SKINCARE Jan Marini Age Intervention Prime Face Primer Review & Giveaway! Jan Marini Age Intervention Prime Face Primer Review & Giveaway! Today i'll be reviewing the newest product from my favorite skincare line, Jan Marini. I was excited to test out the Age Intervention Prime Face Primer. I'm already a fan of the Age Intervention products. I use the eye cream and moisturizer daily and have become addicted to the face mask - it really does work! When I heard that they were doing a primer I was super excited. The idea of combining amazing skincare with makeup is a phenomenal idea. The website claims that this product will give you an Immediate "Airbrushed" Effect Plus Skin Rejuvenation Benefits. The product contains new agents that target elasticity, skin volume, inflammation and wrinkling. Age Intervention Prime instantly perfects the skin and provides a radiant plumped and refined surface. Prime can be worn with foundation for an incredibly smooth and flawless long-wearing finish. Even without foundation, skin looks polished and beautifully reflective while pores and imperfections are minimized. Age Intervention Prime also delivers a potent combination of anti-aging and anti-inflammatory technologies that dramatically lessen the appearance of many aging skin flaws. Skin looks and feels younger from the first application and results are progressively more noticeable with continued use. To read more and find out how to win your own Jan Marini Age Intervention Prime Face Primer, click here! The first thing I noticed is that the packaging is very sleek looking. However, the bottle isn't see through, meaning you can't tell how much is left. Some MAC products are like that as well, which makes it difficult to tell when you're running low. The product itself has a pump which I'm all for. This makes it more sanitary and easier to use on clients. The primer easily comes out of the pump and has a yellowish tone to it. The consistency is very similar to that of Smashbox's original Photofinish Primer. It has a lot of slip to it so it glides over skin really well. I experienced no allergic reactions after applying. Some days, I would just apply the primer with no makeup and see how it held during the day. I noticed it didn't really do much for oil control, so if you're looking for an oil control primer, this isn't for you. However, it does give the skin a nice, airbrushed finish. About 8 hours after I applied, I would come home and notice that my skin still had that smooth, slippery feel from the primer and my foundation would still go on very smoothly. I'm loving that the product contains anti-aging and anti-inflammatory components. Over time, it will help to heal the skin and rejuvenate it. A lot of cosmetic companies try to promote healing agents in their makeup pitch which I don't always buy. However, I'm a user and believer in Jan Marini Age Intervention products, and I'm sure this primer will perform just as well as its skincare counterparts. I think this product is best for non-oily types. It worked great on my dry, sensitive skin. I see it also working amazing on mature skin for its moisturizing quality and anti-aging properties. Summary: This product is very similar to a lot of primers out there in terms of consistency and use...however, it has the added benefit of actually being good for your skin. 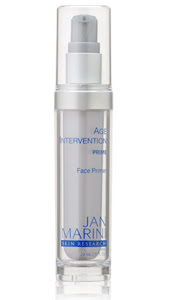 The folks of Jan Marini have generously offered to give away one brand new Age Intervention Prime Face Primer to one of my lucky readers. I will announce the winner on Thursday's post. FTC Disclosure: This product was provided to me by the company to review. I am not affiliated with the company or paid to review this product. I would love to be able to win this product since I'm starting to see the signs of aging and trying to fight them off. I've never tried JanMarini products but I always take your advice and trust your judegment on products. I would love to try this primer cus my skin is similar to your's but of course not exact. Thanks for the giveaway! I am in desperate need of something to heal my skin. I am 33 and the signs of age are slowly appearing. As you mentioned in your post so many companies claim their product is the "one" but then the results are almost zero. I trust your opinion on this product and you do swear by JanMarini. I just told a friend of mine that I need a facial, but its not on my list of priorities. This product could save me from spending $$ that I really dont have at this time. thanks for the oppurtunity!!! im a follower and would like to win this because im always looking ti try new things especially things that arent as hyped about! I would love to try this product. I love primers, but finding one with a treatment would be really great. Also, I would just love to try Jan Marini products, I hear such good things about her line. I hear soo much about JanMarini and how great their products are! I would love to try this because although they are pricey I would deff invest in their product if I knew for myself how great their stuff is. Would love to try this product since I'm just starting to notice signs of aging and i'm mid-forties! I want to keep up the good work-I just need a little help to do it! Haay Ms RenRen :)! I am a new follower and I want to say thank you for providing such great information. I am also new to makeup and find that it is slowly becoming an obsession! LOL...but like you have stated, skin care is still very important. I have been using the same product for years....oil of olay..(did I just date myself? :p), but I am ready to move forward, well mainly because my skin isn't getting any younger. I also have been looking for a primer so I can be more comfortable trying liquid foundation. I would love to win this product giveaway because it seems to have many things going for it. No matter what.. I cant wait to learn more from you and good luck to everyone! Thanks for your giveaways! I discovered foundation primer about six months ago, and I love using it. I would like to try this new brand that combines skin care with the primer. I would love to win this because I have been looking for a good primer. i'm on the search for a good primer.. whenever i come home, it seems like my makeup has halfway come off my face! gah, all of my hard work! haha. I have used the Jan Marini C-esta line and I love it! I would love to try this primer as I have yet to try the age intervention line AND am still searching for my HG primer. I have very dry, itchy skin in the winter in particular. I'd love to try this product. I use all her other products so this would be an excellent addition. I would love to try this on my clients. Many of them are older than 30 and this would be great for them. I've read all about the Jan Marini products you've reviewed. I just started following your blog, you're such an inspiration! I would love to win this primer! Being older now it would be nice to have a primer that works and have the ability to make my skin look younger. I would love to win this product because I splurged on the clean zyme mask and cleanser that go together and my mom threw them out mistakenly and i would love another chance to use one of their products. I would like to have this product because I have never had a primer before and think it's important that is also has skin benefits. I would like to cut down on the skin care products I use in the morning and this product can help me achieve that! Thanks! I dont own a face primer and I would love to try this one out. ahh this product i what im looking for im looking for somethin to give me that airbrush look without using an airbrush gun!!! cuz im saving my pennies for it..
i dont usually purchase unless its a definite musthave!!!! like dior airflash foundation... anyway ive been meaning to purchase a primer and dont know which one to purchase and this is something i would love to try! I would want to try this just from your super love for Jan Marni! I've been testing a few primers lately and while I'm happy with the results, I'm not thrilled with them. They either smooth out my pores but don't help with staying power or vice versa...This sounds like it does a good job at both and since oil control isn't a problem for me I'm dying to try this out! I am on the constant search for a good face primer that does not break me out. I have tried so many and they have seemed to let me down. I know how much you rave about Jan Marini and I think it would be a good idea to test it out myself. I would love to try this product out and see if would do wonders for my face! My face is not the best=( and I would love to try this out!THanks! First of all I want to say that I love your blog... it's really inspirational to me. I don't do makeup professionally, but am obsessed with doing it for my friends and family. I read your blog every day and love all of your looks. I'm interested in both the very vibrant looks and the more muted vintage looks you've been featuring lately. I also really love the reviews you do on your products and how you feature products that are affordable as well as MAC products. I'm a MAC product junkie too but can't afford to but only MAC items. You're also the reason I first stepped into Ulta lol. But anyway, the reason I would really love to win the product is for my mother. She has had a lot of difficulty with her makeup lately and really enjoys it when I help her out. I'd really love to get some products that are just for her to make her feel special but I can't always afford it so winning this product for her would be an amazing start. Thanks so much for your blog, you do makeup beautifully!! does face primer expire? I'm using smashbox photo finish, Maybe I just used it 5 times coz I'm having breakouts coz of hormones but now that my skin has cleared up, I want to use it again but dunno if it has an expiration. No expiration date on the back :( Help!